No Fenders -Formula 1, IndyCar and A Whole lot more..: No Fenders B-DAY: And Thee Number is Six! As in Six is thy number, thee number shall not be three; Three is thy number, four shall not be before six, as thee number five will NOT be before three; Oh Never Mind! As I dunno why? Actually I do - as after all, having just listened to my very first ever Monty Python movie this August in Lord Stanley’s house; Err Stanley Park... I cannot help myself but try to do a very poor impersonation ‘O thy Holy Grail’s counting, eh? 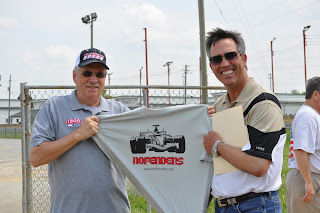 And sorry if you’re looking for some sorta riveting review of the post-Baltimore GP Indy Carz race here... As instead, your humble No Fenders scribe Tomaso has decided to once again trumpet his own horn by announcing; tuh-duh! The sixth birthday of his fascinatingly riveting racing ‘BLOB! Which ironically was launched this very day six years ago! And totally by spontaneous combustion - with NO attempt of being Oh, So Clever and launching it upon that very STUPID day called Nine-eleven; when the Walls came Uh Crashin’ Down! And without further ado, here goes a very brief look back upon the previous five years B-Day No Fenders Salutations - as this past year seems largely unforgettable, mostly due to the further loss of vision and continuous haranguing of Zoomtext’s ABOMINATION called 10.0 - which has made my daily co-existence upon Zed Internetz, Outlook Express and microSOFT’s Word ’03 extremely FUTILE!!! F$$KING CONFUZER PROGRAMMERS! And its even harder to believe that a further half-dozen years prior to thee launching of this Award Winning website; Hya! I was hangin’ out in Modena, Italy NO LESS! With some kOOL Cat named Phil Hill along with attending the Italian Grand Prix! Yet undoubtedly my Nunero Uno memory and cherished event from Year No. 1 would haveda be riding aboard the Synden Racing 2X Seater ‘Beast with Davey ‘STUD! Hamilton as my affable chauffer! Another Year Zoom-Zooms by with another fairly short B-Day message thanking my loyal subjects; Err contributors... Most notably Blogmeister Miguel and Artiste Dave, along with my three amigos - original bureau chiefs: Arizona’s ‘Snowbyrd MJ, Indiana’s Daniel Banes Cooper and Tacoma’s Mary Ellen plus ‘Offical No Fenders Photographer ‘CARPETS and Cub Shutterbug Alex; not to mention No Fenders #1 Fan ‘auntie Harriet! Then May was followed up by getting to do my most cherished No Fenders version of thy ‘Double; Indy and an accompanying Formula 1 race, with this year’s venue being BLOODY ‘Ol Silverstone... So obviously (SNAP! Take that Graham Rahal; Hya! Nice ‘Juan Jeffie...) that was a pretty good year, eh? Sadly, this was the year of remembering ‘Ol Salt Seaman 1st Class Marc of Full Throttle who unexpectedly passed away... As Marc was one of my fellow bloggers - along with being a supporter of No Fenders - with his quick ‘N dry wit, never cutting me too much slack, but in a good way... As Marc made me laugh on a continual basis with his daily scribblings - most notably his continuous zinging of Thy ‘Littlest Curve, aka MAD Max Mosley; whiles 2010 also saw the demise of the “Legendous” My Name is IRL IndyCar blog - along with Linksheaven... Alas, why does two years ago seem such a long ways away, eh? Yet the year wasn’t a total bust, as I attended my inaugural Moto GP race at the Speedway, making it my Centennial “Sandy-wich,” which once again came complete with IMS Media Credential! Being the tenth anniversary of I dunno, whatever, right? I tend to associate the farcical Nine-eleven Day a different way, since it was the year of Mary Ellen driving me Coast-to-Coast in ‘Ol Blue, her trusty 1978 Ford Econoliner Camper-van from Seattle to Indiana for my debutant visit to Mother Speedway for that year’s USGP - on a glorious 17-days MadCap camping safari with some Formula 1 sprinkled into the mix! The last year seems somewhat like a blur - with the shifting of seasons, or is it the tide? Y’all may have noticed my more infrequent NON-racing scribblings which have now become denoted as The Tomaso Files... As I’d definitely haveda say that the top two highlights so far have been a 3-lap 2X Seater ride at Phoenix INt’l Raceway’s 1.0-mile ‘Bullring Ovaltrack aboard the Richard Petty Driving Experience mount - which I’m still awaiting the photos; which reportedly Artiste Dave has just finally copied onto a disc for Mwah! Then another memorable Indy 500 outing courtesy of ‘CARPETS ‘N Duh ‘KuhNucks... Even if it was DAMN HOT this year, eh? Baking in Turn-2 whilst sitting completely surrounded by fans on shiny silver metal bleachers with Dave Calabro announcing we’d broken the 1937 HEAT record that day - with a HEAT index of 100deg-f; SHEISA! And for a No Fenders Nightcap, I’ll attend this year’s inaugural Austin F1 race, which is another story I’m sitting upon... Let’s just say I wasn’t exactly thrilled to see Texas Governor Rick “Good Hair” Perry playing all ‘Squeaky-clean with SPEED’s Willie Buxom on the Monza grid! Hmm? Perhaps that’s where part of my tickets proceeds went too?